Cerovsky V., Slaninova J., Borovickova L., Monincova L., Fucik V.
Increasing resistance of microbial, yeast and fungal strains to antibiotic and antifungal treatment is dangerous trend of last decade. Decreasing efficiency of common treatments poses a serious health and economical problem worldwide. 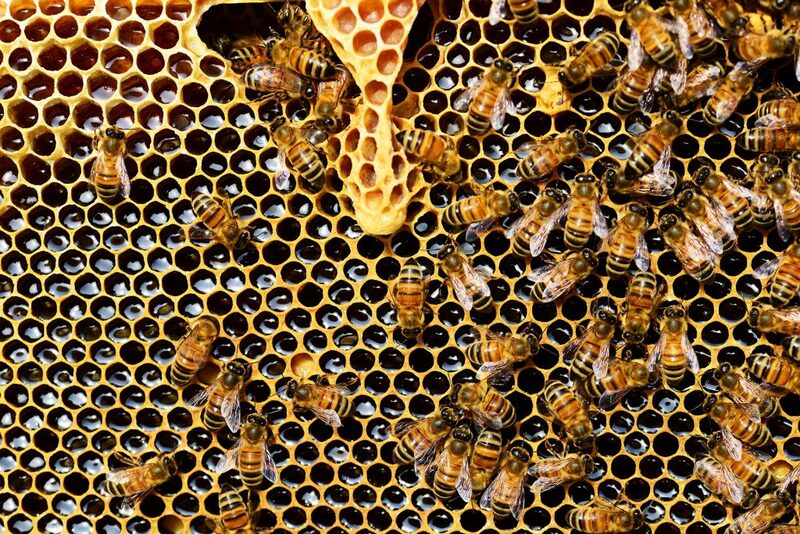 Recently, we have isolated and characterized remarkable antimicrobial peptides (AMPs) from the venom reservoirs of wild bees which mechanism of action promises robust solution preventing further development of resistance. 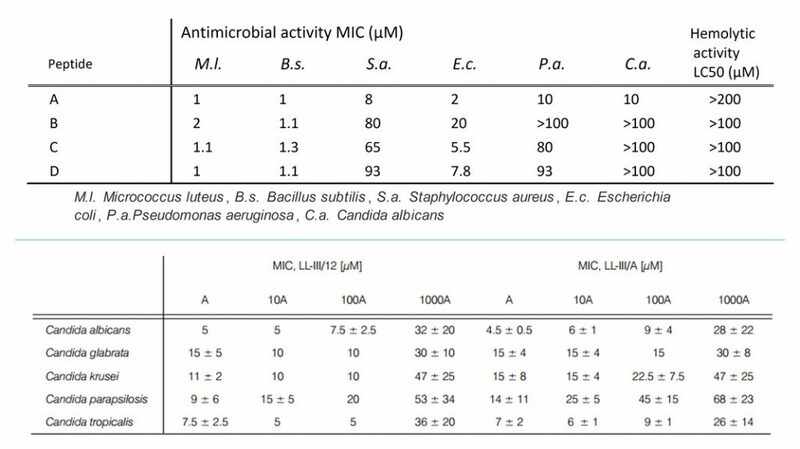 Antimicrobial activity represented by Minimum inhibitory concentration (MIC) has been studied for AMPs using various species of bacteria or yeast and compared with hemolytic activity of peptides. Several candidate AMPs were identified as compounds effective against broad range of pathogens while hemolytic activity has not been observed (see peptide A; Table 1). MIC values of peptides LL-III/2 and LL-III/A for different Candida species and for different number of cells in suspensions (A = circa 0.5-2.5×104 cells per mL) were measured. Peptides were found to be effective antifungal agent even for fluconazole resistant Candida strains (Table 2). Efficacy of various AMPs has been confirmed using various bacterial, fungal and yeast strains in vitro. Simultaneously, AMPs were tested for mammalian cell toxicity and hemolysis. Pilot experiments showed very low irritation using rabbit eye test. Testing of novel peptides and their analogues is under way aiming optimization of efficacy and stability. Tests of skin or mucous membranes irritation are planned. AMPs from wild bee venom are protected by European patents EP 2265631 and EP 2396020. Newly isolated peptides and most promising synthetic analogues will be patented during spring 2014. This is opportunity for future industry partner to select areas of interest which should be covered by patent. Monincová L., Slaninová J., Fučík V., Hovorka O., Voburka Z., Bednárová L., Maloň P., Štokrová J., Čeřovský V.: Lasiocepsin, a novel cyclic antimicrobial peptide from the venom of eusocial bee Lasioglossum laticeps Hymenoptera: Halictidae). Amino Acids 43, 751-761, 2012. Chapuis H., Slaninová J., Bednárová L., Monincová L., Buděšínský M., Čeřovský V.: Effect of hydrocarbon stapling on the properties of α-helical antimicrobial peptides isolated from the venom of Hymenoptera. Amino Acids 43, 2047-2058, 2012. Slaninová J., Mlsová V., Kroupová H., Alán L., Tůmová T., Monincová L., Borovičková L., Fučík V., Čeřovský V.: Toxicity of new antimicrobial peptides from wild bee venom and their analogs towards mammalian normal and cancer cells. Peptides 33, 18-26, 2012.